Part of the Park Inn hotel. 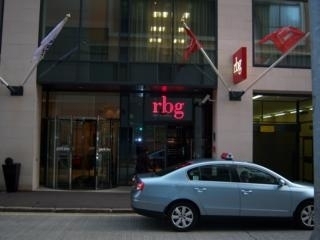 Thrilling and sumptuous are the words that describe RBG! A grill bar that boasts tasty succulent steaks, fresh from the grill, and serves classic New York style cocktails. Relax in the lavish surroundings where the atmosphere is laid back and chilled, but not sacrificing the exceptional service standards. A great place to impress a date, or simply unwind after work with a glass of wine. Have you got Google Earth on your computer? If so, then download the Google Earth view of RBG. Is this the wrong position for RBG? If you think so, then modify its position. Click / Tap the button above to get directions from where you are to RBG.